It’s dandelion season in Maine! Dandelions are one of my favorite wild foods (ok, I have a lot of favorites…), but these ‘weeds’ do rank highly. Join me in New Sharon, Maine for this outdoor, hands-on class where you will experience harvesting, tasting and making herbal medicine. Handouts and recipes will be provided. Discover wild food & medicine in your own backyard! 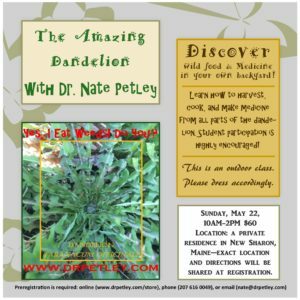 Learn how to harvest, cook, and make medicine from all parts of the dandelion. Student participation is highly encouraged! This event is almost rain or shine (heavy rain will cause us to cancel). Outdoor shelter is provided but please dress appropriately. Preregistration is required and exact location will be provided upon registration. Click here to register online. Call or email to reserve your seat and pay at the workshop. Location: a private residence in New Sharon, Maine—exact location and directions will be shared at registration.